Shelter Cove thanks for the hospitality! You may be wondering, just what is the deal with these hiker boxes? As the old saying goes, one person's trash is another one's treasure. This adage fits hiker boxes perfectly. For the most part they are a dumping ground of stuff that hikers no longer want or need, but imagine might be used by another hiker. At Shelter Cove, we arrived about after the store had closed for the night. Next door was the hiker area, picnic tables covered by a large pop-up tent (like the ones you see at a farmers market). In the back was the hiker box, a fairly large one at this popular resupply stop. I rummaged through it, and scored several items. Generally the things we take fall into two categories: 1) food we will eat right now, and 2) food we will take on-trail to supplement later meals. There are often non-food items in these boxes too (thing toiletries, batteries, partially used fuel canisters), but we haven't yet availed ourselves of any. Category 1 at this hiker box was a few Nature Valley granola bars (Oat n' Honey which is by far the most common brand & flavor of bar we've noticed in the various boxes so far) and a half-full bag of fruit and nut trail mix. We snacked on these while making dinner and I finished it up later that night while writing a blog post. Category 2 items included 3 packages of instant ramen (& I left several behind!) that we added to meals, 5 single serve packets of olive oil, 1 unopened tube of pesto concentrate, and a sealed 8oz bag of chocolate nut and raisin trail mix. This was a pretty high yield by hiker box standards. We often find partially filled jars of peanut butter, Nutella, olive oil, etc. and never really figured out why they were there and not the trash. Huckleberry found a half-full squeeze "lemon" of organic lemon juice and commented on it - who would send this to themselves, then leave it half-empty in the box. Dreamwalker piped up that she had just left it and it was still fresh. Apparently she prefers lemon-flavored water, but doesn't want to carry a full container, so she sends herself lemon juice with each resupply. She refills a smaller container from the large squeeze "lemon" and discards the rest in the hiker box, figuring someone else might want it. Aha! Of course, this still doesn't explain the Costco-sized box of pancake mix we saw in the hiker box at Big Lake Youth Camp.... what thru-hiker makes pancakes? And who paid to mail that huge box to themselves?? In any case, rummaging through the hiker boxes can be entertaining and often we find ourselves a little treat. It has the thrill of thrift-store shopping, and we always look even though. We don't ever "need" ng but what we already have. After my late night of finishing the blog entry at Shelter Cove, I headed back to the campsite and fell asleep. Sure enough, at 2AM a loud train woke me up and it was the southbound Coast Starlight. Over dinner, we had chatted with a NOBO named Kale (never heard his origin story, though he was pretty clear that he did NOT like eating kale so it seems likely ironic), and learned he took the Coast Starlight back home to Sacramento after thru-hiking in 2014. He woke up on the train at 2AM and checked the GPS on his phone to find he was passing Odell Lake in OR - this very spot. I went back to sleep quickly. The morning of Day 42 we stopped by the store for that ice cream we missed last night, and a few treats to supplement what we had decided would be 3 (not 2) days of hiking to our next resupply at Crater Lake. You know that the store staff are used to thru-hikers when they don't even bat an eyelid at folks buying ice cream sandwiches at 7:30 AM. The OST (Oregon Skyline Trail) in a nutshell: A dry, dusty, sandy and thinly forested blast furnace. We hiked back over the train tracks and headed up the OR Skyline Trail. We started our climb next to Trapper Creek, a large and fast-flowing river. This was the most flowing water we had seen since North of Mt. hood, and it was soothing to hear the water tumbling over rocks as we walked. Sadly, we turned away from the creek and soon left the lush forest for a more arid landscape. 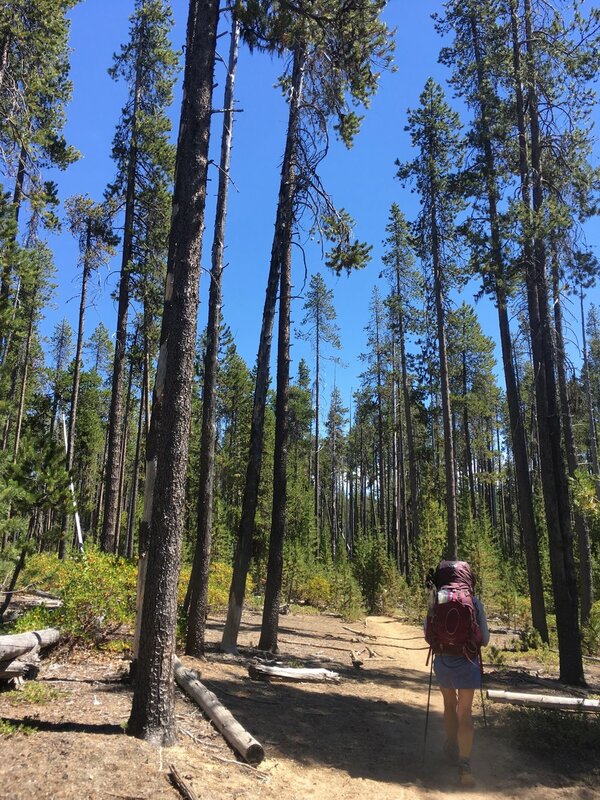 The forest was primarily lodgepole pines that looked pretty stressed and were probably diseased. We passed countless dead mature trees, and the young ones didn't look much healthier. There was one decent-sized but shallow lake, Diamond View Lake, otherwise most of this 20-mile stretch was dry, dusty and hot as a blast furnace (typical in our experience of Oregon's high desert) with just a few shallow ponds. We came across one trail crew who had been doing a lot of work cutting dead blowdown. Thanks! One nice surprise is that the trail passed through a horse camp with faucets. This meant delicious cold water that didn't require filtering, and saved us a side trip to an off-trail campground later on. 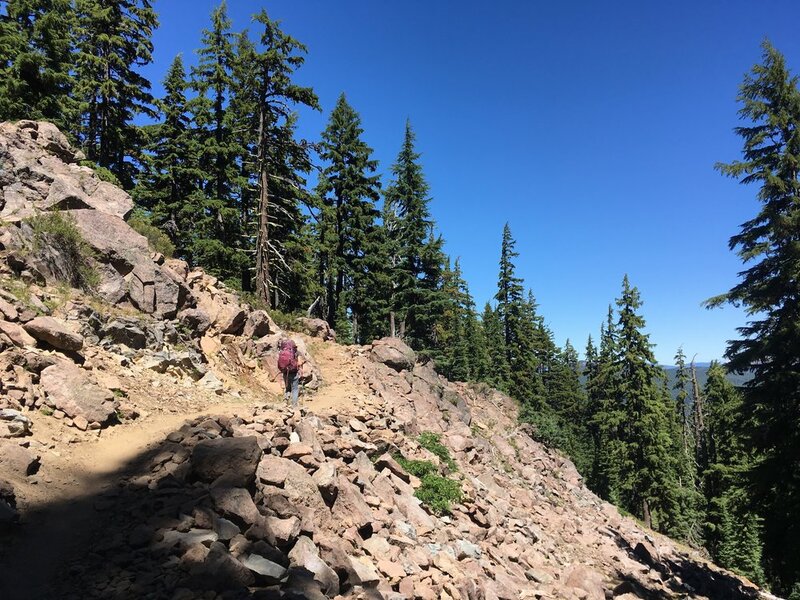 We were not fans of the OR skyline alternate to the PCT - it worked out better in terms of mileage between water and campsites, but if we had another chance we would arrange our days differently and take the higher-elevation official route. Based on the number of NOBOs we passed, nearly everybody makes the same voice we did. In any case, we finally reached the last stretch before re-joining the PCT, a half-mile climb up a forest service road. We met some NOBOs heading onto the skyline trail and they let us know that there was a surprise ahead for us. We arrived to meet Gretchen. Gretchen is from Eugene and has hiked the OR section of the PCT. She drove out to this remote trail head to provide trail magic in the form of a tarp to sit on, cold drinks, and fresh food. At first she was very excited to see us, her first SOBOs, then seemed suddenly apologetic as she realized there was nothing left but water. We were elated to have ice-cold water, and Huckleberry filled her hat with ice from the cooler, a rare luxury. The 4 NOBOs sitting there drinking beers passed over a bowl that still had dregs of fresh fruit - a watermelon rind and a few small tangerines. Huckleberry gnawed the rind and I peeled the citrus for us to share, and it tasted magical. It doesn't take much to make a thru-hiker happy. We thanked Gretchen for her kindness and handed out as its was nearly 5pm and we still had nearly 13 miles to hike. Huckleberry excited to be back on the PCT and some relative shade. Maidu Lake in the morning light. It looks much more inviting than it did at 10:30PM the night before. From Windigo Pass, we were happy to be back traversing forested mountain slopes. It was such a pleasant change to the last 20 miles of dusty, dry, exposed, and often diseased forest through flat terrain. In the shade of the canopy our spirits lifted. Even the small burn zone we passed didn't phase us. Our late start waiting for the store to open this morning and our slow progress due to blowdown in the early miles combined with our water source-imposed goal of 34+ miles meant we would be hiking by headlamp in the dark. To ward off impending hanger and exhaustion on our 3rd 30+ mile day in a row, we decided to make dinner on the trail while we watched the sunset from a ridge, before wrapping up the last 4+ miles. It's amazing what a few calories and a little rest can do for both spirits and hiking efficiency. We donned our headlamps to push on into the darkness for the final miles. Huckleberry and I have hiked in the dark before, but usually just the final mile or so to get into camp. This time it was 4-5 miles. The first thing I noticed with night hiking is that the insects swarmed around my light source. Also, there are obviously no views outside the cone of the light. We did see many large toads that we would not have seen otherwise. Also, some things that wouldn't phase us during the day cause much concern at night. We had passed the last known campsite before our trail junction, when the nocturnal insect chorus was interrupted by the aggressive barking of a dog. During the day, we would have assumed someone was hiking with their dog, but in the dark on this high ridgeline the noise was surprising and made us both uneasy. We continued forward and soon came upon a tent nestled in a flat spot in a small saddle. As we passed, the dog growled low and menacing, and we were happy it was confined in the tent as we heard the person reassuring the pup. It struck us that the camper was probably as unsettled by the cause of the dog barking as we were at the possibility that a stray dog may come at us it of the night. that we were two innocent late night hikers. Finally we reached our junction, and turned down the trail to Maidu Lake. We were truly exhausted at this point and this last ¾ of a mile felt interminably long. We arrived, set up the tent, and promptly collapsed into our invitingly cozy sleeping bags. 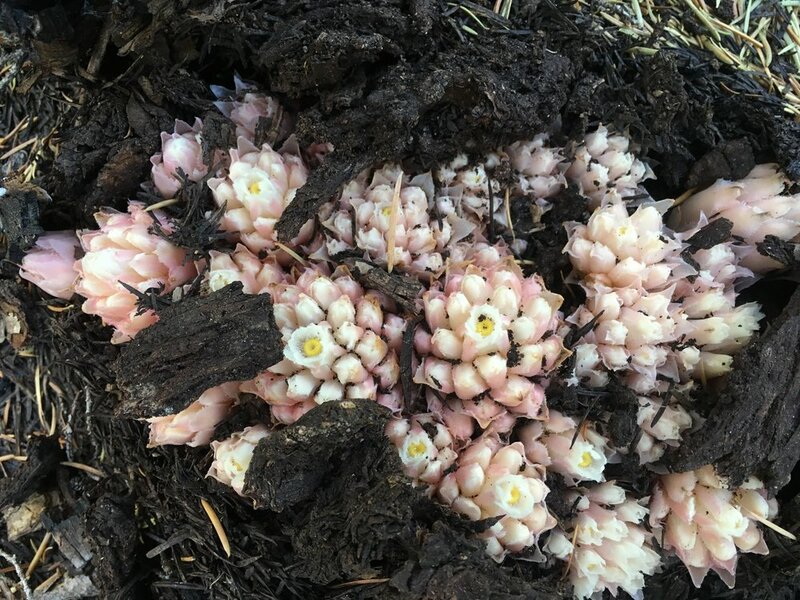 Snow plants emerging from the dry forest duff. Happy to have a sloped traverse with views and talus. We again kept a tally of NOBO thru-hikers we passed on day 42. At Gretchen's trail magic area, one of the NOBOs asked us if he was near the front of of the pack. He was crestfallen when we told him they were numbers 55-58 we had seen today and that we had probably seen several hundred in the past 2-3 weeks. Despite taking the "alternate" trail, we saw a total of 77 that day. The highest concentration was near an off-trail spring that the closest water source around, and 6 miles before our campsite. There were 12-15 hikers in a very small opening there and the scene was like happy hour at the local bar as we hiked by in the early evening. We haven't seen another SOBO since we passed the 3 guys below Shale Lake on the evening of Day 36, but the NOBO flood gates are well and truly open. Tipsoo Peak is a brilliant burgundy from its volcanic origins. Another view of Tipsoo Peak from near the WA/OR high point. The next morning, we slept in. We had completed 3 x 30+ mile days and our longest hiking day at over 34 miles. Day 43 was our on-trail Nero, with only 10 miles to reach Thielsen Creek, which Dreamwalker promised would be a stunning spot. After a very leisurely morning, we set out just before 11am. We enjoyed the forested slopes and were soon had mountain views. About 5 miles into our day, we reached a saddle between beautiful maroon Tipsoo Peak and grey and craggy Howlock Mountain. At the saddle was a sign documenting that we had passed the highest point* on the PCT in WA/OR (spoiler alert, there will be a higher point tomorrow). As many others have noted, the high point itself is a bit anti-climactic as it is surrounded by trees on a high plateau, with no views of anything. But we took an obligatory picture and continued on.